One year on from the launch of the NDP, EY hosted a round table discussion with key stakeholders focused on the enablers to delivering its vision. How has the delivery of the National Development Plan (NDP) progressed in its first year? What are the challenges in delivering the plan? For semi-state organisations, it has started very well. 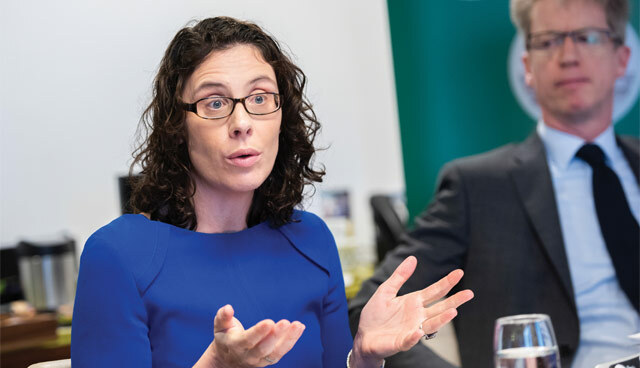 The large semi-states, such as ESB, are ahead of forecast in their five-year plans and they account for about 25 per cent of the overall plan to 2040. On the direct government side, significant progress has been made but challenges have been evident in the last number of months in terms of people’s heightened focus on infrastructure projects and cost overruns. We’ve seen the National Broadband Plan and its potential cost emerge, and that, with the National Children’s Hospital, is putting significant strains on central government in terms of affordability. I think the semi-state organisations were much more organised and have more continuity in infrastructure plans, whereas central government can be more stop-start. They don’t have the same visibility and budgets and that’s what makes it challenging. With the added challenge of budgets being cut back next year because of other constraints, that makes it difficult. The semi-states and organisations such as the National Transport Authority (NTA) had already completed a significant level of infrastructure planning, so much of the thinking behind these plans was already done and could be rolled into the NDP. It is some of the larger projects driven by central government where, unfortunately, we haven’t seen as much progress as we would have liked. However, what’s important to highlight here is that the development and publication of the NDP was an incredible achievement for Ireland and we shouldn’t underestimate the value of having a long-term vision set out for the country’s future. Now that we’re one year into the plan, we shouldn’t lose that enthusiasm and so we need to ensure that projects such as the National Broadband Plan and the National Children’s Hospital, which are certainly challenges, don’t take away from all of the progress we have made. Planning and the public’s perception of large scale infrastructure projects will always be a challenge, however, it’s important to remember that we see these issues around the world in the delivery of any significant projects such as these. Ireland is not immune and rolling out plans for the national benefit will always experience growing pains. I think what we would like to see now is for further progress and clarity on timing around some of the larger projects. It’s important to have a plan and the NDP is a good one. Continuity is really important, particularly for the delivery of infrastructure. ESB Networks, together with CRU, is planning our next investment cycle from 2021 to 2025, and the NDP gives the context for this. In terms of progress, we can see a lot of advances in renewable electricity. We connected over 300 MW of renewable electricity generation to the network last year alone, bringing the total in Ireland to over 4 GW. When I checked this morning 59.47 per cent of the island’s electricity was being generated from renewables – that’s tremendous progress. So, many aspects of this plan are already working well and the challenge is to keep progressing further and faster. As a state, we need both civil infrastructure: water, waste, transport, and social infrastructure: education, healthcare, social housing, childcare – and the facilities must be planned and prioritised for future needs. Over the next 20 years, there’s a population increase of one million people predicted here and another half a million in the North, so we must prepare for this growth. This will mean putting in strategic infrastructure to ensure the growth is sustainable, compact and smart. Ireland 2040 is very welcome, we believe that the National Planning Framework’s 20-year approach is central to enabling prosperity, wellbeing and long-term growth and meanwhile, the NDP provides a 10-year pipeline of projects and should encourage confidence in the wider construction sector. It’s a very challenging time and we face challenges from increased demographics, climate change, Brexit, skills shortages and digitalisation. From the NTA’s perspective, we were in a particularly good place because we had a transport plan in for the greater Dublin area and one for Galway as well, which allowed us to put projects forward as part of the NDP. We have been very successful with the largest spend ever by the State in terms of public transport. We are working on the transport strategies for Cork and Limerick, with Waterford to follow. We’re consulting on the BusConnects Dublin programme, the MetroLink preferred route and the DART expansion. We’ll focus on the purchase of fleet first and procurement can begin hopefully later this year. We have to build up delivery teams, both internally and externally, and we’re actively recruiting. From our perspective, the key challenges are getting buy-in from the public and our key stakeholders and then achieving a successful planning outcome in as short a time as possible. We endorse the benefit of having a plan to keep people on track, whether it’s to measure ahead of, or behind, a plan. Ireland has often been criticised in the past for having ad hoc development. If I can use one example, we recently turned the sod on a new runway; in 1968 the planning maps had a dual runway system in place for the area in the exact location where the two runways were put in place and the zoning around those were maintained in the main. Twenty-one years later, the first of those runways was built and 30 years after that, the second one has now commenced. I think we need to emphasise that there are plans in Ireland, even if we may not have been as good at sticking to the plans in the past. It is that sort of foresight that we need to continue to support. Interestingly, the runway was included in the NDP, but we would view ourselves as customers of the plan as much as participants. For our role, we need to see infrastructure development, whether that’s utilities, housing, or connectivity to the airport. building delivery teams now and have been very active over the last couple of months so we can move on to agreeing the details and scope. From that, we have to start agreeing the cashflow; the Government has pledged €116 billion from now until 2027 for the overall NDP, with the bulk coming in the latter half of that timescale. The pressing issue for us is that we are about to place an order for a new fleet, which will be delivered in the summer of 2021, subject to Department of Finance and Cabinet approvals. That’s a long time for something we need now, but that’s the wait time for any railway in the world. 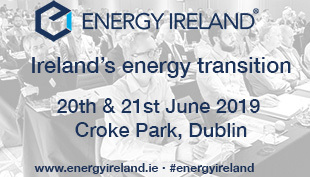 What role will transport have in meeting Ireland’s low-carbon aspirations and in driving future economic growth? How do we deliver high-quality international connectivity? Transport accounts for 20 per cent of Ireland’s emissions and of that 20 per cent, 98 per cent is from the road transport category. Tackling road emissions is crucial to Ireland meeting its carbon reduction targets and we have three principles to address this. These are avoid, shift and improve. Reducing travel demand is a long-term goal of the NPF, creating more liveable towns, cities and communities which are placed closer to employment and other social and community services. The shift we envisage is toward more sustainable modes of travel, utilising low-emission technology to transition the private and public fleet to electric and hybrid. Investment in the NDP will enable us to build capacity into our public transport systems and to encourage a modal shift. As an organisation with a considerable diesel burn we recognise the contribution we can have on reducing the carbon footprint. Targets set in 2006 were for each industry to reduce carbon output by 33 per cent by 2020 and, despite a growing service pattern since then, we hit our target by 2017, with an overall reduction of 40 per cent currently. We did this through smarter processes and were aided by the purchase of a new fleet throughout the noughties, which brought new technologies and efficiencies. The NDP and the shift towards electrification represents a major opportunity for us both in terms of hybriding our existing fleet and also looking to electrification potentials in the expansion of the DART. I see the progressive removal of carbon from electricity generation as a cornerstone of the move towards electrification of transport. 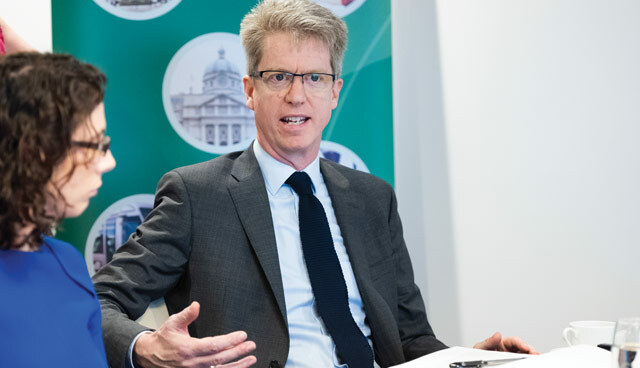 Public transport is taking steps towards electrification and I also believe that we are at a tipping point for the electrification of the private car fleet. The take up of electric vehicles is increasing and all global car brands have made public commitments and significant investments. The challenge for us is to ensure the infrastructure is ready to support this shift. It’s something that we are working towards and we have already changed our standard for new network developments in anticipation of the demand. I am confident we will provide the network infrastructure to support the 500,000 electric vehicle target set out in the NDP to 2030. Education and communication are important tools in this regard. There is a perception that electric vehicles present risk to journey completion and the availability of charging facilities. However, recent advances are evident, and those improvements need to be better communicated so that more people recognise electric vehicles as a realistic option. Alongside this, we also need to promote the various benefits that low-carbon transport offers and the work being done in this space by our transport organisations. As organisations, we all need to focus on what we are doing within our own structure but also how these knit together under the umbrella of the plan. In daa, we are actively working to decouple growth from resource consumption, by reducing our carbon and energy footprint. We are already well ahead of our 2020 energy reduction target with over 40 per cent reduction against baseline. We are also using more Low Emission Vehicles, and particularly electric where possible, on the airport campus, while encouraging others to do the same. Anne’s point about traffic avoidance is an interesting one. In Fingal, where we are based, the same number of people leave the county in the morning to go to work as the number that arrive from other areas to Fingal. So, somewhere the right jobs are in the right place for the wrong people and this is undoubtedly replicated throughout the country. Data analytics is crucial to us understanding where and why people are travelling. Understanding this data and sharing it amongst our organisations will enable better and more meaningful contributions to the NDP. Dublin is one of the world’s most congested cities and yet this isn’t reflected in our population density. We have a strong attachment to the car and we need to transition away from this aided by the various major projects such as BusConnects, the DART Expansion Programme and the MetroLink etc. However, outside of Dublin there is a necessity for regional development to relieve pressure on Dublin and development along the Atlantic economic corridor can act as a counter-balance in terms of attracting people, employment and investment. On delivering high-quality international connectivity, it’s essential that Ireland has a fully interoperable transportation network, connected internationally to all strategic entrance hubs. We also need to ensure that post-Brexit the border remains free and open. It is worth noting that while low-carbon transport has huge benefits, there is a premium attached to it currently. There is a cost with low-carbon investment. What are the priorities in transitioning to a low-carbon and climate resilient society that is a key objective of the plan? Over the last three years national greenhouse gas emissions have increased by 6.4 per cent. It’s clear we won’t meet our 2020 climate targets and achievement of the 2030 targets is now suspect. Each of us has a part to play in the transition to a low carbon economy but as engineers we see our key involvement as being around the building of resilient infrastructure. Spatial planning, housing, commuting and access to services have all been identified as major influences on health and wellbeing and we are strongly supportive of building up smart and sustainable city regions. As part of this, population and jobs growth should be spatially aligned and should be concentrated in urban areas with access to services. The key is to continue to take carbon out of electricity generation and to use clean electricity to decarbonise heat and transport. There has been huge progress already. Renewables as a proportion of Ireland’s electricity mix have grown to 32 per cent and the carbon intensity of electricity has more than halved since 1990. Huge opportunities remain and, while hydro and onshore wind have been responsible for the bulk of progress to date, solar and off-shore wind will be a massive addition over the life of the NDP and will really move the dial on the transition to a low-carbon society. Another area of huge potential is the requirement for 550,000 new homes identified in the NDP. Ensuring that new dwellings are equipped to be carbon neutral, with heat pumps and other technologies, presents a huge opportunity, as does the retrofitting of existing properties. The smart metering programme rolling out from 2019 will also give every citizen the potential to play their part in the sustainable energy future. We need to not be afraid to be disruptive and to challenge ourselves. For example, moving away from the traditional method of sending masses of fleets to sites and embracing modular housing. On the other side, we need to incentivise people living in existing housing stock to examine their energy usage. If we can change habits, there are substantial carbon savings to be made. The transition to a low-carbon economy must be front and centre for every project going forward. If we can initiate low-carbon design into projects now, we will put ourselves in a better position. It is also important to understand the changing requirements of society through technology and data analytics, and use this information to inform the delivery of infrastructure. How should the plan be funded? Will private finance have a key role? We need to change the currency from just capital investment to take a whole life-cycle approach. We recently refurbished our main runway and upgraded our lighting system. In doing so we recognised not just energy and carbon reduction benefits but also wide maintenance and connectivity benefits. These are benefits you don’t recognise unless you take a holistic approach. I appreciate it is more difficult to have that focus with exchequer funding, where allocations of capital and operating funding are separate, but we can take that approach as we’re not funded by the State. Funding the plan and the role of private finance is around risk management as much as anything else. It’s how you risk manage projects for the State, given the State’s priorities. Value for money is a priority but so too is certainty and recent large projects have not offered that certainty. Trying to get the private sector to absorb more risks on large projects has merits but it also has downsides in terms of scope and contractual detail, which adds time. In the NDP, funding for the semi-state bodies is coming from commercial revenues but, with the exception of water (80 per cent exchequer), the rest of the plan is largely exchequer funding. A small element is marked out for PPP and maybe that will need to be revised in the context of a challenging fiscal environment. If so, I think we need to prepare to think from a risk management perspective. The private sector undoubtedly has a role in the delivery of the NDP, however, it is not the answer for all projects and it is accepted that for certain parts of the NDP, Government is best placed to fund and drive out delivery. Private finance brings benefits, and the main benefit is risk transfer. Private financers want certainty and as such, completing a whole life cycle assessment of a project is important to consider and to accurately model their return. This isn’t a bad thing, especially as it brings increased rigour to a project. An important element to consider is how to bring private finance into projects. There are many different models being used around the world and they don’t necessarily have to be PPP. It is important that these new forms of financing and contracting are considered. One of the key challenges for us is to grow the business while maintaining our financial strength, so that we can continue to invest in energy infrastructure and services as well as returning dividends to the Government to invest in the national plan generally. Continuity is important. Long-term visibility of investment requirements, based on the NDP, allows for confident development of capacity in the system. Steady and stable growth is most conducive to overall delivery. I think there is a lack of awareness that organisations such as Dublin Airport or ESB are self-funded and in fact, contribute a dividend to government. There is an expectation that everything that is spent in the state sector is coming from the exchequer. Taking the airport as an example, 50 per cent of our revenue comes from our commercial streams and that breeds greater innovation in business. That private funding comes through the semi-state sector too is an important message to get out there. Is there enough capacity to deliver the investment in the plan? The delivery of the NDP is going to require a skilled labour force and a substantial compliment of engineers. We know that there are too many empty seats in universities and colleges across the country. I think we need to appreciate the value that there is in science, technology, engineering and maths (STEM). We have a problem and we’re seeking to address it by importing the expertise from abroad, we’re getting highly-talented engineers from South America. We’re going to have to be open and adaptable and look at something like apprenticeships and technicians, something outside of traditional engineering courses. In our industry, in the last six months, we’ve seen that the expertise needed is in short supply at the level that we need them. So, we have to change and we’re going to have our own in-house programmes. We must recognise that we’ve had a decade of underinvestment, and that decade is washing through all industries in terms of the expertise resource. We have to look at a way of catching up. We plan for the perfect team and are now realising we can’t get everything we want so we’ll be looking at innovative ways, including training people up in-house. There has been some good planning done, but areas of expertise are where we need to see improvement. The construction industry will play a crucial role in the successful delivery of the NDP. A recent analysis by EY-DKM Economic Advisory found that the availability of workers is currently a key challenge for the sector, with elementary construction workers, skilled craft workers, technicians and professionals in high demand. There has also been a rise in tender prices which has arisen from these limited resources as well as increased demand. If we don’t tackle this resourcing issue, the cost base in the sector will become uncompetitive, and potential cost escalation on projects may have an impact on the delivery of subsequent projects within the NDP, due to constraints on funding. We haven’t seen a big constraint yet because we’re still in the planning phase and dealing with consultants who have international teams. We’re a small country, but I think a lot of our consultants can draw on international expertise. It will be in the hard construction where we face challenges as we begin to build out in many areas. When we think about the large projects like MetroLink, you would be bringing in a construction team with that tunnelling expertise. It’s where we go for smaller projects like BusConnect, which is essentially a road scheme, where we’re going to be challenged. We’re all going to be funnelling all these major projects through An Bord Pleanála and it will be challenging for them. We will submit our plans and An Bord Pleanála will have their timeline to make a decision, but I would imagine that all these plans will come within a very short space in time and some consideration should be given to some sort of phasing. That planning bottleneck is something that will require serious investment and planning expertise isn’t something that’s built up overnight. Ireland doesn’t have the kind of international profile we might think we do. Many of the international construction companies that Dublin Airport has communicated with didn’t have any awareness of the level of investment available. Tying to investment of national scale means that companies won’t just come to Ireland for single projects, but will look to partner up before the tender phase. I think the scale of the plan might leave us competing for resources, but also attracting resources as well. I think there is real opportunity in the long term. The Apprentice Council are doing some really nice work with taking the 20-odd traditional apprenticeships and doubling that number in newer areas. We see more carbon intense activities being transitioned out and there needs to be an opportunity for those people to re-skill. We take about 100 young people into our apprenticeships per year and are increasingly getting a better male/female mix. We need to go back into the schools, things like RDS Science Blast even at primary level, to get kids interested in STEM. I do believe that there’s going to be a real opportunity for them there given that the economy is driving so many other areas away. 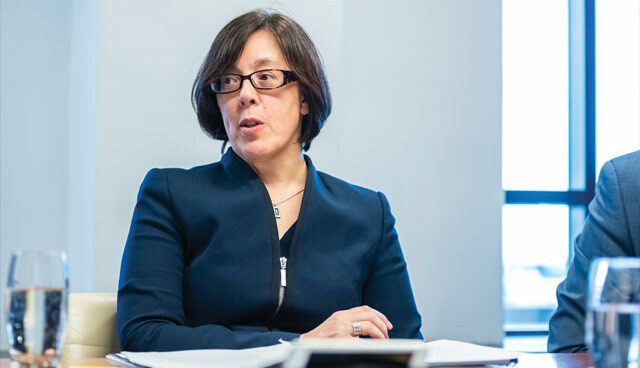 Cathy Bryce is a director of the National Development Finance Agency and New Era. Prior to these roles, she was Head of International and Syndicated Lending for AIB. She has over 20 years’ experience in capital markets roles. 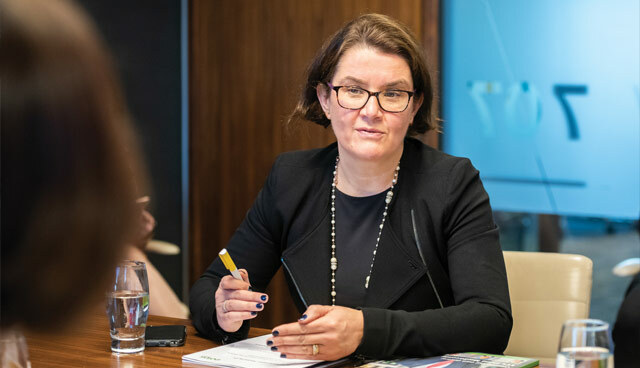 A graduate of Trinity College, INSEAD in France and Harvard Business School, Cathy has also worked as an investment banker for Morgan Stanley and as a corporate financier for ABN AMRO. Anne Graham is the chief executive officer of the National Transport Authority and was previously an NTA Director. Prior to this, she was a chartered civil engineer working with local Dublin authorities on drainage, roads and traffic. She was also a project manager on the redevelopment of O’Connell Street and an Area Manager in Dublin’s South West. 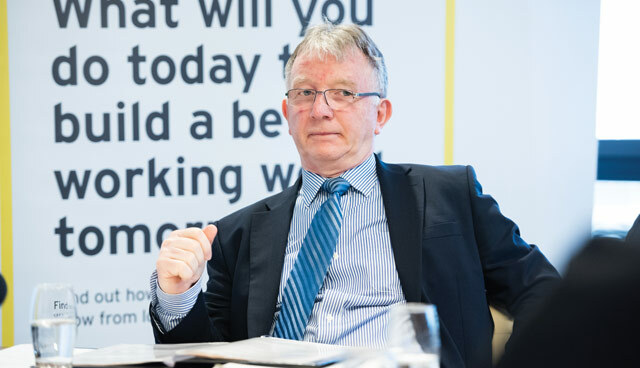 Paddy Hayes is managing director of ESB Networks, appointed in July 2018. 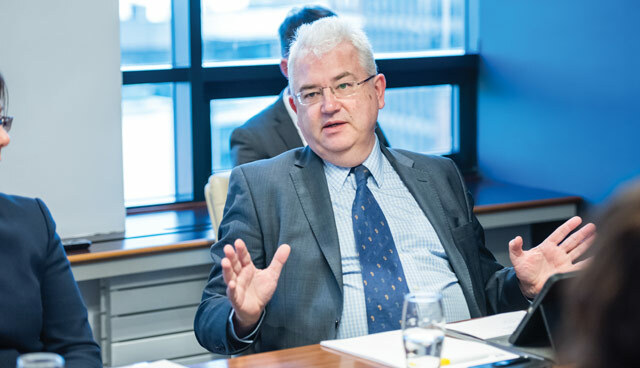 Having previously worked with British Steel, Paddy was Executive Director of ESB’s Generation and Wholesale Markets business prior to his current role. A graduate of University College Dublin and the University of Warwick, he is also a chartered engineer. Vincent Harrison is managing director of Dublin Airport, a role he has held since 2014. Prior to this, he was the Director of Strategy, Regulation and B2B and has held senior positions with Esat/BT and Rubbermaid Inc. in the past. A chartered accountant, Vincent is a graduate of University College Cork and the University of Pittsburgh. Ferga Kane is a director on EY’s Government and Infrastructure Advisory team, a post she has held since July 2017. A graduate of UCD, she has almost 20 years’ experience in advising public and private sector clients on the development and financing of large infrastructure projects. She is also part of EY’s Valuations, Modelling and Economics team, where she advises on financial modelling development and review assignments. 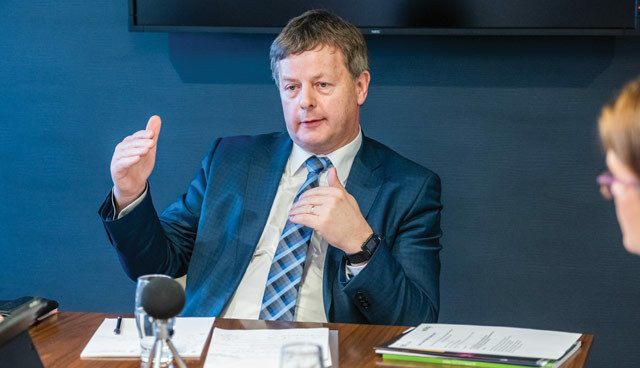 Jim Meade is the chief executive of Iarnród Éireann, where he had previously been Director of Railway Undertaking and Director of Train Operations. Jim joined Iarnród Éireann as a fitter in 1983 and went on to hold management roles such as District Manager in Limerick and Regional Manager for Ireland’s west prior to his current role. Peter Quinn is the president of Engineers Ireland. He worked in Belfast, Monaghan and Nigeria before beginning his own civil and structural engineering consultancy in his home county of Tyrone. He is a chartered engineer, was admitted as a Fellow of Engineers Ireland in 2007 and is a graduate of Queen’s University Belfast.